The eyes are not only the windows to your soul but the windows that reveal your age! The delicate skin around the eyes ages quicker than the rest of the skin on our face. With time our eyes start to look more tired, and you will start to notice a little sagging, and some lines. Puffiness and dark circles make the already thinning skin around the eyes, look even more tired. The processes starts off gradually, until one day you wake up and look in the mirror to your horror and surprise, you've AGED! 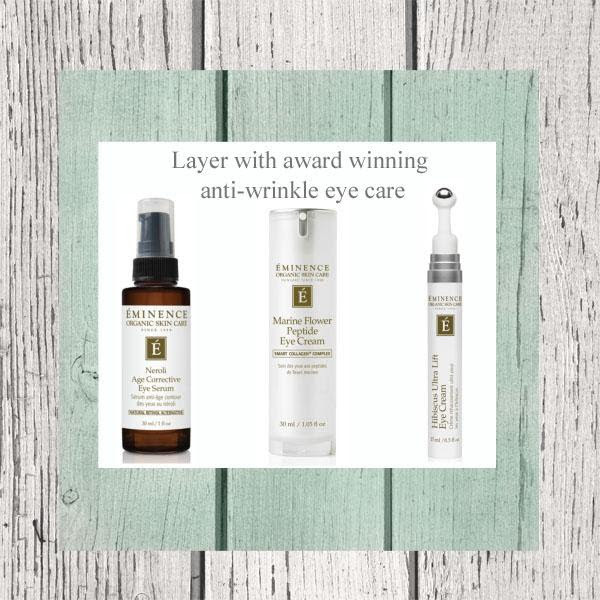 Thanks to the advances in technology and with products like Eminence Organic skincare, there are things you can use to turn back the years, and give your eyes that rejuvenated look it once had. Using one eye cream all the time is not going to solve all the issues that your eye area is having, although its better than not using anything at all. Layering different serums around the eyes is the best way to deal with multiple issues around the eyes. Different ingredients work in different ways to achieve results. So don't limit your self to one product. Layering also helps customize to specific problems around the eyes. Serums, having smaller molecules can penetrate deeper into the skin for better correctional work. Your eye creams will work those upper layers of skin and help keep the area moisturized. The combination of Eye Serums and Creams can offer better and more dramatic results. These eye creams do work as I've witnessed the results myself. Hibiscus Ultra Lift Eye Cream instantly lifts and firms. It also helps to quickly reduce puffiness. It has some long term effects but its main job is more superficial, as its working right below the skin in order to get those instant firming results and reducing puffiness. It also will help with dark circles. Neroli Eye Serum is your retinol alternative. Collagen boosting ingredients to prevent and reduce lines. It also firms and its rich ingredients gives some additional moisture to the eye area. Lavender Night Eye Cream is a rich night cream with stem cells that works on the deeper layers of skin, for those with deep lines, and crows feet. Because its working deeper into the skin, it is not instantly firming. This eye cream is best to keep for night using a different eye cream/serum for day that deals with other issues like dark circles, or for getting that instant firming effect most of us want during the day. Marine Flower Peptide Eye Cream is a new product with advance technology and its key ingredients- Red algae, Botanical Peptides, Botanical Hyaluronic acid really reduce lines, plumps and firms the eye area. It really moisturizes, reduces puffiness, and dark circles. I found that it has dramatically improved my upper eye area quickly due to its plumping effects and my eyes do not look as tired. It is a great all in one eye cream. If you can only get one eye product, the Eminence's Marine Flower Peptide Eye Cream should be your choice. But again, layering does create better, more dramatic results. Choose one serum to go underneath it, or several if its in your budget. The products last a long time, so in the long run you save money, get results, and avoid more costly procedures that don't have long term results that are good for your skin.